These Chocolate Mint Brownies are a three layer bar. 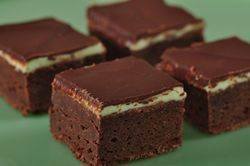 The brownie layer has a deep chocolate flavor and a dense and fudgy texture. While wonderful on its own, it tastes even better with a layer of mint flavored cream and a thin coating of dark chocolate. The best way to describe them is that they taste like you are combining a brownie with a peppermint pattie. As I said above, this is a dense and fudge-like brownie. It is the same brownie recipe that I used for the Cream Cheese Brownies. I really like how easy this batter comes together. It is hand mixed and only one bowl is needed to complete the task. Once the brownies are baked and cooled, they are spread first with a creamy mint flavored frosting and then a shiny chocolate glaze. The mint layer is a simple butter frosting with a cool and refreshing mint flavor. The mint flavor can come from adding pure peppermint oil or extract or you can even add Creme de Menthe. The difference between peppermint oil and peppermint extract is Peppermint Oil has a much stronger and more concentrated flavor than peppermint extract. I added a little green food coloring (entirely optional of course) so that everyone knows immediately that they are mint flavored. Brownies have been popular since the 1920's yet we do not know for sure who invented them. Jean Anderson, in her book "The American Century Cookbook", gives us a few theories. One theory is that a woman named Brownie invented them. Another is that a housewife from Bangor Maine invented them by accident after her chocolate cake collapsed and instead of throwing the cake away she decided to cut the flat cake into squares. Both stories seem plausible and there are probably many others, so I guess we have to be content just with the fact that at least someone in America invented them. Chocolate Mint Brownies: Preheat your oven to 325 degrees F (165 degrees C) and place the rack in the center of the oven. Have ready a 9 inch (23 cm) square baking pan that has been lined with foil across the bottom and up two opposite sides of the pan. Then lightly butter the foil or spray it with a non stick cooking spray. In a stainless steel (heatproof) bowl, placed over a saucepan of simmering water, melt the butter and chocolate. Remove from heat and whisk (or stir) in the sugar and vanilla extract. Add the eggs, one at a time, beating well after each addition. Beat until the batter is smooth and glossy. Then stir in the flour and salt. Pour the brownie batter evenly into the prepared pan. Bake in the preheated oven for about 22-25 minutes or until the brownies start to pull away from the sides of the pan and a toothpick inserted in the center of the brownies will come out with a few moist crumbs. Remove from oven and place on a wire rack to completely cool. Mint Layer: In the bowl of your electric mixer, fitted with the paddle attachment (or with a hand mixer), beat all the ingredients until smooth. Add a few drops of green food coloring if you want the frosting green. If the frosting is too thick, add a little extra cream. (The frosting should be just thin enough to spread.) Spread the frosting evenly over the cooled brownie layer. Place in the refrigerator for about 15-20 minutes or until firm. Chocolate Glaze: In a heatproof bowl, placed over a saucepan of simmering water, melt the chocolate and butter (or shortening). Spread over the mint filling and refrigerate for about 15 minutes or until the chocolate glaze is dry and set and starts to dull. Remove the brownies from the pan by lifting with the ends of the foil and transfer to a cutting board. With a sharp knife, cut into about 25 squares. It is a good idea to wipe your knife between cuts with a damp cloth. These brownies can be stored in the refrigerator for several days or else frozen.